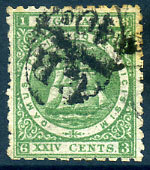 (PML.73) on 1878 QV 6d light yellow-green upr. 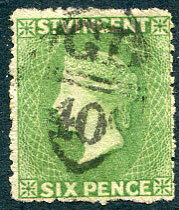 star wmk (SG.26a, Cat.£29), fine used. 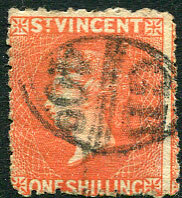 (PML.73) worn strike on 1877 QV 1/- (dull) vermilion P.11 to 12½ x 15 (SG.24, Cat.£85), good, used, slight horiz. crease. 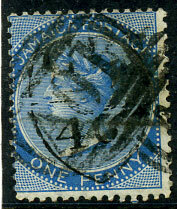 superb on QV 1d CC wmk (SG.8a), rarely available. on 24c green, some toning.